The Monterey Institute of International Studies is hosting a Tedx event. TED refers to the wildly successful annual conferences that bring together people from technology, entertainment and design to give short talks about their lives. Tedx events are community organized programs that following a similar format to the TED conferences. 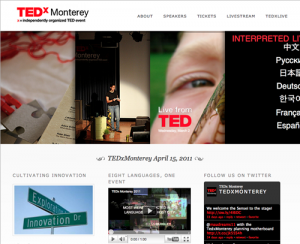 TedxMonterey is happening on April 15 and will be livestreamed and live-interpreted to the web. Speakers will include dancers (including Middelbury’s Andrea Olsen), drummers, environmentalists, researchers, entrepreneurs and artists. This entry was posted in LIS Staff Interest and tagged arts, MIIS, TEDx on April 6, 2011 by Jess Isler.